Santa Monica has passed a law with new smoking rules that affect all multi-unit housing, and that includes condominiums. Follow this link to review the new municipal code. Follow this link to review a related notice from the City of Santa Monica. What follows is a description of the new law as it impacts condominiums. Condominium associations must complete a smoking survey of current unit residents by 1/21/13, and unit owners will be required to designate their units either “smoking” or “non-smoking”. For details about this process, go to smconsumer.org. Current or existing unit residents can continue to smoke inside their units if they designate the units as “smoking”. If an owner or resident (and for the purposes of compliance with this new law, condo associations should survey both owners and tenants) fails to respond to the survey, that unit will be “undesignated” for the purposes of the final results. Not sure what that means. Time will tell. Once the survey is done, condominium associations are required to distribute the updated list of all units’ smoking status to all owners and, apparently, to residents as well. In the future, the list must be kept updated and given to all prospective “renters and buyers” along with a copy of an information sheet (also available at smconsumer.org). Although not stated, it is presumed that owners will be responsible for advising their tenants; the associations will be required to produce the list and information sheet in escrow along with the other documents specified in Civil Code Section 1368. Existing Santa Monica law already bans smoking in residential outdoor and indoor common areas, including balconies and patios and any area within 25 feet of any door, window or vent. If a condominium association is already 100% smoke-free, the designation process is not required. 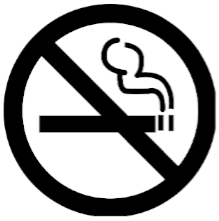 Condo associations will be required to post a sign regarding the law prohibiting smoking. Follow this link for a sample sign. And, the law does allow condo associations the ability to designate a smoking area. Go here to find out more. The good news is that the condo associations are not saddled with enforcing this new law and prohibition on smoking. Santa Monica says that “most compliance is achieved through communication. If that fails, and a person persists in smoking inside a non-smoking unit after getting a written notice, the person may be taken to small claims court and is liable to pay damages starting at $100. Any person (meaning a neighbor or other impacted association resident) can enforce the law by giving notice and eventually going to small claims court. Condominium associations are not required to enforce the prohibition on smoking. They are only required to conduct the survey and keep updated lists available. However, if a condominium association refuses to conduct the initial survey and give out the required information, the association can be prosecuted for violating the Municipal Code.